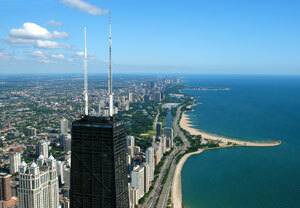 It’s known as the Windy City and the Second City. Next month, it may be known as host city to the 2016 Olympics. Famous for its skyscrapers, sports, blustery weather, and bloviating politicians, Chicago offers plenty to do for any visitor. Chicago’s tourist mecca is a broad stretch of Michigan Avenue known as the Magnificent Mile, so named because of the magnificent damage it does to your credit card. Stroll southward past ritzy boutiques (Chanel, Burberry) and crowd magnets (Apple, American Girl). When you get to the river, board a vessel for your prearranged tour with the Chicago Architecture Foundation (architecture.org), the best way to see the city in ninety minutes. If you’ve got kids, visit Shedd Aquarium (sheddaquarium.org) and decide for yourself which city claims superiority, or wander into Lincoln Park Zoo (lpzoo.org) without paying—because it’s free! Baseball fans should make the necessary pilgrimage to Wrigley Field; watch the game at Murphy’s Bleachers (murphysbleachers.com), Old Style in hand. Come nighttime, jam to tasty licks at Buddy Guy’s Legends blues club (buddyguys.com) or catch an improv show at famed SNL launchpad Second City (secondcity.com). There’s no shortage of corporate chains, but for a more intimate experience, we recommend a stay at one of the city’s many boutique hotels. The newly opened Hotel Felix (hotelfelixchicago.com) is designed top to bottom to meet silver LEED certification, from the paperless front desk to energy-efficient plumbing. Also new is The Wit (thewithotel.com), a sleek Doubletree property in the theater district; watch skyscrapers sparkle from the rooftop lounge, guaranteed to be a scene on a warm night. Situated just off Michigan Avenue, The James (jameshotels.com) is a sophisticated spot with top-notch amenities and a generous 2 p.m. checkout. Chicago’s most iconic hotel is The Drake (thedrakehotel.com), a grand, 535-room edifice with an unobstructed view of Lake Michigan and the Gold Coast. Opened in 1920, The Drake has counted Winston Churchill and Princess Diana among its guests. Its afternoon tea service, available 365 days a year, is an experience in its own right. Chicago’s signature cuisines aren’t exactly diet-friendly, so cut yourself a break while scarfing down a Polish sausage and duck fat fries from Hot Doug’s (hotdougs.com), an “encased meat emporium” with a fanatical following. Italian beef sandwiches were invented here; try one with hot or sweet peppers at hole-in-the-wall Mr. Beef (312-337-8500). While you can’t go wrong with deep-dish pizza from chains Lou Malnati’s or Giordano’s, mix it up with a fresh Neapolitan pie from Spacca Napoli (spaccanapolipizzeria.com). For fine dining, Grant Achatz’s acclaimed Alinea (alinea-restaurant.com) is not to be missed; make reservations in advance and experience a parade of shockingly inventive dishes that has been likened to performance art. For a classy lunch, dine at Terzo Piano (terzopianochicago.com), Tony Mantuano’s operation in the new modern wing of the Art Institute (artic.edu/aic), and enjoy stunning views of Millennium Park.